There is something new downstairs. Have you seen it? That large black wall stretching down the hallway near the elevator? No, it’s not a new interior design element. It’s an artist’s blank canvas! Art, that ancient and universal language, has been a part of being human since being human was a thing. We have always had the creative impulse for ritual, music, dance, and visual arts. Anyone who studies art knows the range of human expression that stretches from cave paintings to modern performance art and everything in between. But why do we create? And can art be a spiritual practice? An internet search of “art as a spiritual practice” returned 164,000,000 results so I guess there is a bit to learn. There are books, videos, Ted Talks, psychology articles, religious articles, scientific journals, panel discussions, workshops, artist blogs, and so much more. If we think of spirituality as getting to know yourself so you can connect with something bigger than yourself we see how art can be a spiritual practice. Art provides us a vehicle for contemplation and self-reflection. It can heal the wounded spirit, allow us a deep engagement with mystery, and help us in the search for meaning. When we create art for the process and not the product we are free to express ourselves without judgment. We can create for the sheer joy of creating – no artistic talent necessary. When I was in first grade, my art teacher commented that I was coloring my picture wrong. That you are supposed to color in only one direction. I needed to choose either side to side or up and down but not both. She explained how that would make my art better. She was probably right, it would most likely have made my picture look better. But it didn’t feel better. As a matter of fact, it felt terrible. I have carried that one simple comment into adulthood as a judgment on my artistic ability and creativity. Doing it wrong or not having the skills or talent to do something often stops us from trying something new. I challenge you to release that inner critic. Art as a spiritual practice is not about the product. It is about the process. I challenge you to try art as a spiritual practice and see where the process takes you. The Chalk Wall is available to everyone to begin your art as a spiritual practice. Beginning in March, the Art Cart will be stocked with art supplies to continue your journey. All are welcome to come downstairs to create art. Bring your coffee, bring your friends. Parents, bring your children and create something together. Each month will be a different theme and different supplies. The Art Cart will be available in the downstairs lounge every Sunday following service and will be “open” until 12:30 pm. But don’t wait, come downstairs this Sunday, grab some chalk and start doodling. You can’t do it wrong. Families – don’t forget to stay and sing with Barbara Miller on March 3, 2019, for our Family Song Circle – a great way to celebrate our UU faith and culture, all are welcome! The Adult RE committee is searching for new workshop offerings for the spring and fall. What can you share with our community? Want to read about what the kids did in RE this week? Misplaced your weekly newsletter? Just curious about what we do “downstairs?” Click here to read this week’s edition of the UUCSJS Religious Education News. After a period of directing the loving-kindness toward yourself, bring a friend or someone you care about to mind. Repeat the same phrases with the word you instead of I. Allow the intention of these words to really sink into your mind and your heart. Continue the meditation bringing to mind other friends, neighbors, acquaintances, strangers, animals, and finally, people with whom you have had difficulty. Why not spread that radical love we Unitarian Universalists like to talk about and bring your faith home each evening with a bedtime loving-kindness meditation ritual? The teens are working on a project to create a chalk wall in the hallway near the lounge. Keep an eye out for its completion and come on down to create some art! Families – don’t forget to stay and sing with Barbara Miller on February 3, 2019, for our Family Song Circle – another great way to celebrate our UU faith and culture. The CRE Committee will be hosting a Family Potluck on February 28, 2019, at 6:30 pm in the lounge. More details and a sign up soon. With the winter holidays just behind us, I have been thinking a lot about traditions. Our family has a number of wonderful holiday traditions this time of year. From decorating a snow tree for wild animals on Winter Solstice, to celebrating the 12 nights of Yule, to reading ‘Twas the Night Before Christmas before heading off to bed on Christmas Eve. Traditions help make this time of year special and connect us to each other, our past, and our faith. I am sure many of you also have wonderful holiday traditions that connect you as a family with each other and your faith. Do you also have everyday traditions that connect you with your Unitarian Universalist values? Growing up, our family said grace before meals. It was a daily reminder of our faith and values. As a UU, I still appreciate and value the idea of giving thanks for my meals and still need a daily connection to my UU faith. So how do we find that daily connection? How do we take our faith home with us each week? What traditions can we pass on to our children that will connect them daily to their UU faith? This month, I would like to offer you the idea of a blessing, a meditation, a moment of thanks to offer before eating a meal. This daily tradition can be a way to share our faith and values with your family. While there is not one saying all UU’s share, the UUA worship web offers a search to help you find words that may be meaningful to you and your family. Or, have a family discussion, see what principles you want to highlight in your blessing, do a little internet searching, and make your own! Write your words down, maybe hang them somewhere in your kitchen. Say your blessing at each meal to create a meaningful daily faith tradition for your family. We have so much to be grateful for. The Gratitude Tree in the lounge is overflowing with those things our congregation is thankful for. As we enter the winter holiday season, I hope that you will remember to come to the lounge, to add more leaves to the tree, to remember all those things for which we are grateful. If your family celebrates Hanukkah, Winter Solstice, Yule, Christmas, Kwanzaa, or even if you celebrate none of these holidays, in America, November and December can be busy and stressful. There are presents to buy, decorations to put up, traditions to continue, cleaning to be done, food to be cooked, treats to be baked, memories to be made. It can all feel like too much. It can all start to feel meaningless. I challenge you to have a more intentional winter holiday this year. Ask yourself what is really important about the holiday you celebrate this time of year? What rituals or traditions are important to you and your family? What brings you joy? How can you focus more on what you want and less on what is expected? We are surrounded by a culture that may seem inauthentic to us but we can make other choices. How do your holiday activities align with our UU Principles? To your family’s values? It is alright to say no, to slow down, to find joy in this winter season. I’ll tell you a little secret about joy – the more you give away, the more you have. So this December give joy aware freely. You can start with this Random Acts of Kindness calendar. You don’t have to do all of these things, you don’t have to do them on the days listed. This is not one more thing to add to your to-do list. These are ideas to get you started. And trust me, once you get started it is hard to stop. You will find yourself throwing out joy everywhere you go, all year long. Making room for the activities on this calendar can be your first step to celebrating your winter holiday with joy and intention. RE Lending Library is OPEN! If you have been downstairs in the Lounge area recently you may have noticed some changes. We have a new RE Lending Library! Children’s Religious Education has a great collection of books. The last few months the books have been sorted, cataloged, organized, and labeled. Over 450 books are available for you to read and take home with you. There are books on Unitarian Universalism, UU parenting, world religions, LGBTQ stories and resources, social justice, books for teens, nature, meditation, and other wonderful and inspiring stories for reading and sharing. You can view the catalog at https://jessdunnsaf.libib.com/, then come on down and learn something new, share a great story, increase your awareness, and live out our values. The library is still growing. If you have book recommendations or more topics you would like to see on the shelves please email me. Hope to see you downstairs reading soon! Planning has begun for this year’s fall celebration in Children’s Religious Education. With the help of some wonderful and knowledgeable volunteers, the children will learn about the Mexican celebration of Dia de los Muertos, Day of the Dead. Day of the Dead originated several thousand years ago with the Aztec, Toltec, and other Nahua people, who considered mourning the dead disrespectful. Death was seen as a natural phase of life and the dead as members of the community, kept alive in memory and spirit. Traditionally, celebrations take place on November 1st and 2nd however our celebration will be held during RE on Sunday, November 4, 2018. The children will learn about the history, traditions, activities, and foods of this yearly celebration of the life and ancestors. We will create ofrendas, (don’t forget to bring pictures of loved ones who have passed away), decorate sugar skulls, and of course enjoy delicious treats. All are welcome, so if you would like to learn along with the children or would like to volunteer your time, knowledge, or experience, please join us. 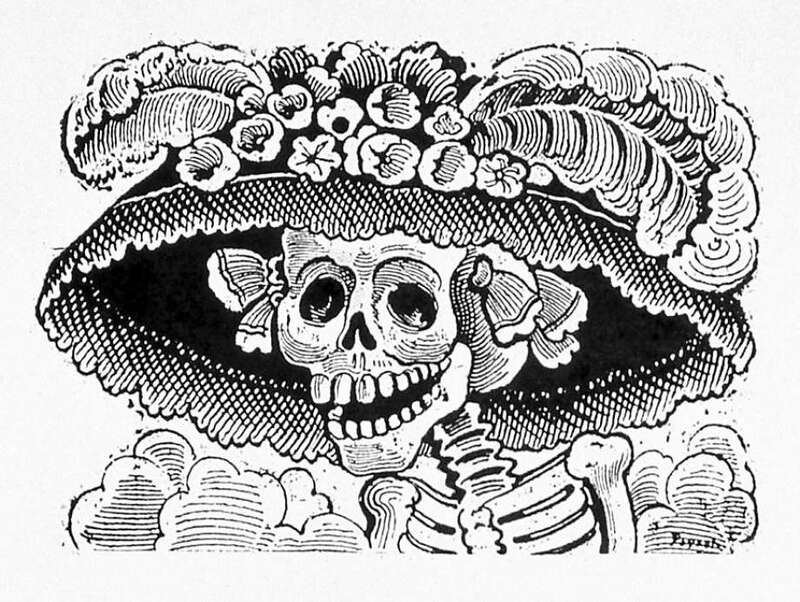 Enjoy this Literary Calavera, a satirical type of poetry created during Dia de los Muertos! convertido en calavera. And fighting the dead.